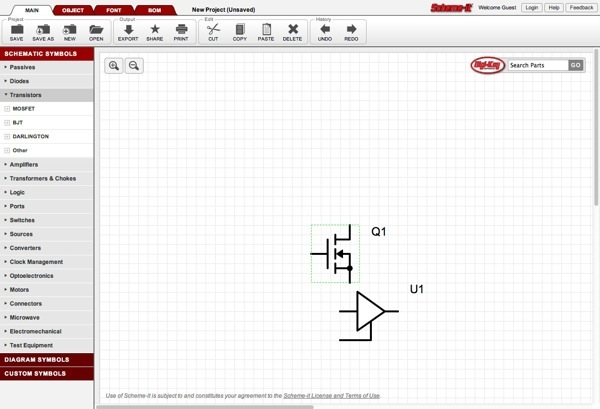 SchemeIt | Free Online Schematic Drawing Tool by Digi-Key « Adafruit Industries – Makers, hackers, artists, designers and engineers! Just played with it for a few minutes. Right now it’s more or less a toy; the schematic symbols are all abstract parts. (e.g., there’s no “microcontroller” category). But if Digi-Key takes a long term view, this could change everything. Big time. I hope this is a serious investment and not somebody’s hobby. An ECAD program and a huge parts supplier is a really powerful combination. I know in the past tracking down everything for a large Digi-Key order often takes me hours; it’d be great to automate it. They’ll need several years of development with a full time staff (think PCB layout, parts DB, etc). I wonder if Digi-Key has enough clout to start insisting their suppliers provide SchemeIt compatible symbols and layouts? Or maybe SchemeIt compatible parts might float to the top of the list when you search for components? Perhaps they could crowdsource it, updating the library as people complete designs. Thinking even further down the road, if this was connected to a PCB fab and assembly service (at reasonable prices), Thief River Falls could be the next Shenzhen.